Drain And Sewer | Brooks Plumbing Co. The sewer line in your plumbing system is the main line that removes wastewater from your home and moves it into the civic sewer system. Sewer lines are typically buried under the ground in your yard, which keeps them safe from damage and wear from the weather. When trouble crops up, it requires the services of a professional plumber. We carry the most up-to-date equipment and use professional methods to access the sewer line, enabling us to repair leaks, clean out clogs, and address other issues without needing to excavate the pipe. Of course, this would mean you actually spotted signs of sewer line trouble to begin with, and know that you need Olympia, WA sewer line services. It’s important as a homeowner that you don’t attempt to formally diagnose a problem with your sewer line. However, you can spot the common signs of a problem. When this happens, it’s time to call in a pro ASAP. Posted in Drain and Sewer | Comments Off on Is Your Sewer Line in Trouble? Keep Store-Bought Cleaners Away from Your Drains! Drain clogs are an unfortunate reality, and one that many homeowners have to deal with at some time or another. However, clogs are also one of those things that people address incorrectly. When a clog develops in a drain, most people reach for some type of store-bought drain cleaner to manage the problem. This is actually not a good way to deal with it at all. Keep reading to learn why you instead want to trust your drain cleaning needs to trusted Lakewood, WA plumbing professionals. 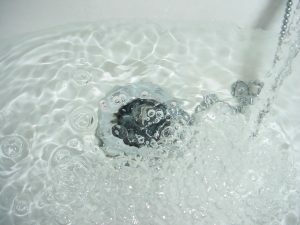 Posted in Drain and Sewer | Comments Off on Keep Store-Bought Cleaners Away from Your Drains! Drain Cleaning: When Do You Need It? The drain and sewer system of your Tumwater, WA home is one of the most important parts of your plumbing system, if not the most important part. If it isn’t well cared for, it can create serious problems for the entire plumbing system. Fortunately, though, it’s actually fairly easy to keep your drain system in good shape. You need just remember to schedule drain cleaning services on a routine basis. But how do you know when it’s time to do so? Keep reading to learn some of the signs to look for, which indicate a drain cleaning session should be a priority for you. Posted in Drain and Sewer | Comments Off on Drain Cleaning: When Do You Need It? While you aren’t responsible for your community’s municipal sewer service, you certainly shouldn’t ignore the sewer lines that run from your home to where they connect to that service at the street. You can count on your city to handle the maintenance and repairs of their portion, but it’s up to you to care for your part of the system. Fortunately, when you do find yourself in need of Lacey, WA drain and sewer repairs, you needn’t look any further than our team. But first, you’d need to know the signs that something is actually wrong. 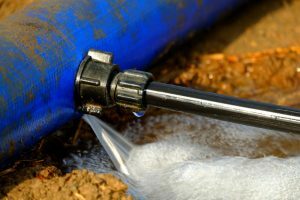 There are a number of issues that can cause sewer line problems, from the growth of tree roots to a backup of waste in the line. Keep reading to learn more about the signs of sewer line trouble. 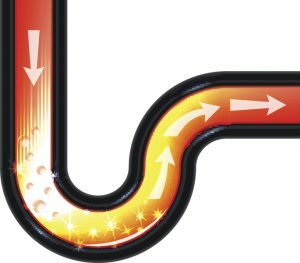 The drains and pipes of your plumbing system probably aren’t something you think about a whole lot. That is, until something goes wrong with them. And even then, you’re likely tempted to go out and by a chemical drain cleaner, or perhaps even attempt drain snaking on your own to remove a stubborn clog. First off, store-bought chemical drain cleaners can actually do more harm than good—clogging up your drains even further and even causing corrosion. Attempting drain snaking on your own—without the appropriate training, experience, or knowledge of how to use the tools involved—can end in property damage and personal injury. 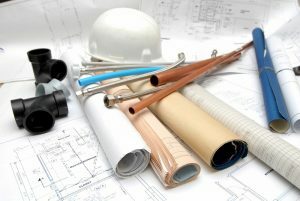 What you need instead are professional drain snaking services in Dupont, WA. What’s Causing Your Bathroom Clogs? There aren’t many household problems that are more inconvenient than that of a drain clog. Chances are pretty high that at some point during homeownership, you will need to deal with a clogged sink or shower drain in your bathroom. If you are lucky, you’ll be able to relieve the clog with a plunger. But sometimes a plunger is not enough. Your natural inclination then may be to try store-bought chemical drain cleaner. Unfortunately, these cleaners are pretty abrasive and can actually end up doing more harm to your pipes than good. Additionally, this only provides a temporary solution as it doesn’t get to the root of the problem. So then, what exactly causes bathroom clogs? 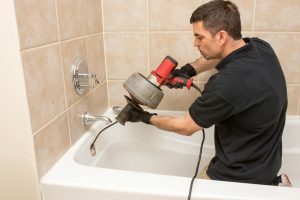 Posted in Drain and Sewer | Comments Off on What’s Causing Your Bathroom Clogs? The average Olympia home’s plumbing system is pretty complex and usually hidden from view. This is beneficial for many reasons; however, it can also cause a couple of issues, particularly when it comes to diagnosing problems within the plumbing system. For years, the only way to find a specific plumbing system issue was to tear up your pipes until they could be physically examined. This was hardly a cost effective of energy efficient method. This is why we now use video pipe inspection. This technology allows us to ensure that your plumbing, drain, and sewer system are still in decent working condition. The garbage disposal is a fantastic appliance. It makes cooking a lot easier and more efficient, and also helps to keep your kitchen clean during food prep. You’re able to easily clean as you go, and washing dishes after dinner is simplified too. So when your kitchen sink drain develops a clog, you probably find yourself wondering if your garbage disposal is broken. Oftentimes, your garbage disposal is not to blame. It’s also not the solution to certain clogs, as it just cannot adequately handle everything you might put down your drain. Keep reading to learn more. As a homeowner, you don’t want to deal with plumbing problems of any kind. However, the one area of your plumbing where you particularly don’t want to have any trouble is you sewer line. This is the section of plumbing responsible for collecting wastewater and transporting it beneath your home and front yard to the municipal sewer pipe in the center of the street.